Police came to the rescue of the infamous galactic villain when actor Dave Prowse's vehicle broke down on his way to a Star Wars fan reunion. In other news, the BBC likes ridiculously pun-worthy headlines. David Prowse may be the most famous actor nobody has ever heard of. As Darth Vader in the Star Wars trilogy, he was the physical portion of one of cinema's most instantly recognizable villains ... but his face was concealed by a mask and helmet, and most people remember Vader for James Earl Jones' iconic voice work. 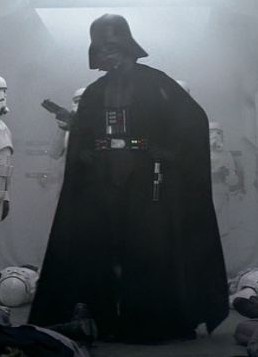 Still, even if you wouldn't recognize Prowse walking down a street like you might Harrison Ford, he was Darth Vader, and as such is recognized as the Commander-in-Chief Worldwide of the 501st Legion of Imperial Stormtroopers. Prowse was on his way to a gathering of the group at the National Space Centre in Leicester when his car broke down on the M1, leaving him stranded with a car full of photos and Star Wars merchandise. But as we all know, Darth Vader was once a powerful Jedi Knight, and the Force came to his aid. The "Highways Agency motorway rescue force," to be precise - traffic officers rescued the stranded Prowse and delivered him to his destination, where one imagines he directed the 501st Legion to actually find the damn droids they were looking for, for once. This story comes to us via the BBC, making it the most groan-worthy Star Wars pun headline we've seen in years. The BBC has a ways to go, though, if they want to ever top "Skywalkers in Korea Cross Han Solo."